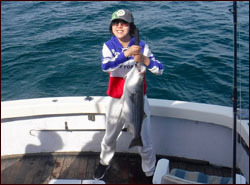 To arrange a charter, or for more information, you can call the telephone numbers listed. If you would rather send an email, please include a telephone number and the best time to call. We will get back to you as soon as possible. Remember, the Stunmai II fishes out of Rock Harbor, in Orleans. Rock Harbor is a tidal harbor, so sailing times are dictated by the tides. Click here for the scheduled sailing times of the days you are interested in.